Open not only in the front, but in the back as well, this life-size, sexless torso features removable lungs, two-part heart, stomach, liver with gallbladder, intestines with pancreas, half of a kidney, and the front of the bladder. The back is open from the cerebellum to the sacrum, and the seventh thoracic vertebra is removable. In addition, the removable head is dissected to show internal details of nose, mouth, and eyes. 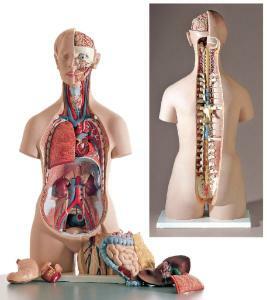 The 15-part model is mounted on a base and includes the “Torso Teaching Guide” and CD-ROM with illustrations and text.